It was strange to see that image again. 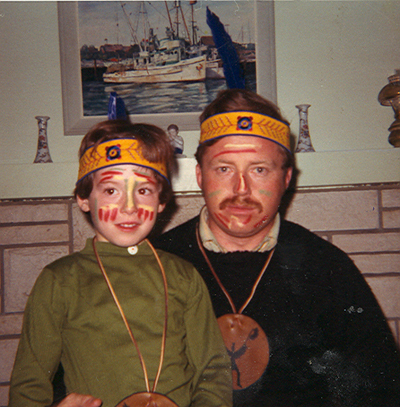 My father and I at a meeting of Indian Guides, a kind of pre-Boy Scouts thing for young boys and their fathers. We were in the “Cherokee Tribe”. I was “Little Red Hawk”. He was “Big Red Hawk”. I only remember fragments about the experience—I was probably in it for only a year or so. They would beat drums at meetings. You wore warpaint. You wore leather hand-made badges of the tribe around your neck. I think we did some kind of craftwork stuff at meetings, whatever it was that six-year old kids could do that was plausibly “Indian”. We went on some kind of trip up to the Angeles mountains and there was still a good deal of snow up there, to my chagrin, since my mother sent me without any snow gear at all. It had all the basic embarrassing goofiness of all organizations of its type, that kind of ur-Shriner or Rotary Club manly associational thing, but also the extra absurdity added on top of a bunch of Anglo men and their boys playing (badly and inauthentically) at being Native Americans. Many years later, I reminded my dad of Indian Guides, and he commented, “Of all the dumb things that a dad has to do for his kids, that was the number one dumb thing by a mile”. I couldn’t agree more. 1) Racial or other forms of social identity and associated forms of social inequality seem to have a lasting character, persisting in the United States and other societies even when major legal and political discrimination ends. There must be something about social identities which draws its force unconsciously from everyday practice and culture rather than formal legal and political structures. 2) Language and representation are not “just” words, but acts. The identity of a speaker, the social context in which he or she speaks, the relation of a speaker to an audience, and so on, make an important difference. The same words in two different contexts mean two entirely different things, and the context in which those words are interpreted also changes their meaning. 1) Speech acts and cultural representation are an important part of the maintenance of discrimination and the definition of social identity. You can argue with either of those foundational propositions. You can certainly argue with the combined argument. But they’re not obviously silly or trivial; they have a lot of validity to them. They’re serious arguments, not intrinsically leading to the kind of schoolmarmish politics that later came out of them and that are today a rhetorical staple of institutional and cultural politics for some groups on the left and the right. Where did those ideas go so badly wrong? Well, I think it might have something to do with the way something like Indian Guides or the Atlanta Braves tomahawk chop ended up being understood: first, with a lack of proportionality; second, with a lack of proper historical perspective; third, with a lack of interest in intentionality; fourth, with a lack of curiosity about the general phenomenon of impersonation and identity play in American society. The lack of proportionality is the easiest mistake to catch, and is the chief reason that “political correctness” is now such a punching bag. If Indian Guides was a part of a system of representation connected to the oppression of Native Americans, it was a ragtag, left-over bit of trivial effluvia, not as some activists put it, the centerpiece of the "dehumanization" of Native Americans. The foundational arguments behind political correctness insisted on the seamlessness and coherency of oppressive systems of representation, claiming that every symbol and sign with even the least visible hint of a stereotypical referent to race, ethnicity or gender is imbricated with equal vigor in lynchings or violence against women or the Trail of Tears. One typical example: we had a “teaching event” here at Swarthmore after a student here showed up at a Halloween event in blackface where one of the students in the audience managed to leap casually from talking about the history of blackface to being angry that some of his peers mistake him for his brother—a person to whom he had a close genetic relationship. Part of the reason for this lack of proportional differentiation between the way that different symbols in different contexts are tied to the maintenance of discrimination has to do with a disinterest in the cultural, intellectual and social history of these representations. Indian Guides in the 1960s was a harmlessly stupid thing in part because was an impotent and discarded leftover of a much more charged, violent and painful history. I dou’t doubt that as such it could give pain or offense to a Native American who feels a victim in the aftermath of that history, but the fact that a symbol or practice invokes some past practice or representation for an individual does not make it equal to that past practice. I might see an allusive hint of past oppressions in a present-day text, but to collapse the distinction between then and now is to live in a kind of hallucinatory atemporality. We sometimes run into students here who insist that the present condition of African-Americans in the United States is indistinguishable from antebellum slavery, and thus that the acts of representation which seem to them to have a racial component must be equally indistinguishable from the cultural experience of enslavement. That collapsing of distinctions trivializes past suffering while also making it impossible to have a real and tangible politics in the present: it denies any motion or change in the past, and so cannot imagine a condition of change in the future. This collapsing of distinctions is at its worst when it applies itself to culture, speech or representation. “Political correctness” seems to have most profoundly grated on general sensibilities when it ran (and still often runs) roughshod over intentionality, when it discards any interest in why someone said or did something and takes the determination of meaning in a speech act as entirely dependent on what someone hears or feels it to be. No one involved in the creation or perpetuation of Indian Guides was setting out to create a relation to the social position of Native Americans in the United States in the 1960s. The participants might be said to have been blissfully, foolishly ignorant of and uninterested in how a bunch of white guys calling themselves the “Cherokee Nation” and making lanyards might play in that wider world, or look to the descendents of the Cherokees, but the innocence of the participants is also a material and political fact worth taking seriously before making any criticisms. Audiences at Atlanta Braves games don’t set out to say anything when they do the tomahawk chop: they’re just doing what fans at Braves games do. To tell them that what they are doing means something that none of the audience actually intends to say is unsurprisingly alienating to some. So many of the conflicts and critiques spurred by identity politics borrow the rhetoric of legality, charge people with crimes—but if we’re going to talk about crimes, we have to talk about intentionality—it’s a centerpiece of our ideas about justice and injustice. To get easily ruffled by Indian Guides, or anything comparable, is also to miss a more complex history underneath it of racial and gendered impersonation, of people playing at being other identities not to mock or hurt, but honestly to explore and make creative use of the experiences of others, however ineptly. Indian Guides isn’t that different from the kind of cultural cross-dressing associated with the legacy of Karl May in Germany, or with any number of other kinds of practices that are at least as complicated politically and culturally as various practices of drag or transgender performance that tend to get exalted rather than attacked within identity politics. To me this is the most important thing that we've lost sight of, the most interesting thing to re-examine. None of this is to say that Indian Guides shouldn’t have turned into Y-Guides or what have you, or that Braves fans shouldn’t rethink the tomahawk chop. But whether those things happen or not is simply not terribly important: no one’s politics should be built around pressing hard for those kinds of changes. (Or defending strenuously against them, perhaps.) There’s not that much at stake, and a much messier cultural history, with more meanings and possibilities, than conventional identity politics is inclined to credit.